450Bushmaster.net • View topic - Excessive powder residue? Long time lurker....new member! Hi! Finally made it out to shoot my factory Bushmaster 16" 450BM upper yesterday. All of the ejected casings have what seems like excessive black goo/burnt powder residue around the rim on the outside of the empty case. Ammo is Hornady Black 250gr. Shot 15 rounds and all look about the same. No damage to cases other than some scratches from the metal feel lips on the factory bushmaster mag. I haven't ever seen this or even close to it with any of my other calibers .556/.204/300BO/6.8. Didn't have any feed or eject issues, eject was at exactly 3:00, accuracy was acceptable for my skill level, no can, carbine buffer. BCG was a little on the dry side, and the only change made to the upper after the factory was a Ross brake which came highly recommended by all of you! Any thoughts? Just need to break it in? Over/under gassed? Sloppy chamber? I don't want to overthink it, just making sure I don't have a safety issue. Hoot covered it pretty well, but I'll throw in my experience. 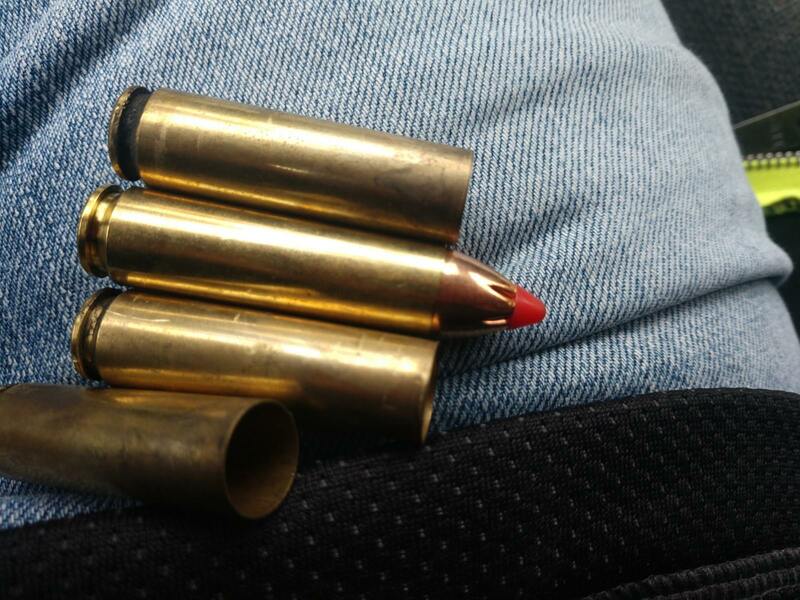 For my Bushmaster factory upper, I get sooting quite often with Hornady factory ammo. Usually it's around the mouth, maybe a little further, but sometimes it will have soot at the extractor groove. Back when I had Remington ammo, I believe it did this most of the time probably because it was underpowered, or just from all the inconsistencies of the ammo, but I also noticed Remington had one of the smallest cases for the 450B. That probably played a role, too. With my Tromix barrel, I don't usually see sooting with factory ammo. If it does, it's only a little, just around the case mouth. It has a tighter chamber than the Bushmaster, and the Tromix is most likely cut better, too. I can still get some sooting if I use very light hand loads. My BHW has a chamber on the larger side, so it will soot quite a bit on low end handloads. I don't recall if it sooted with factory ammo, as I have put only a few through it. Thanks for the replies guys. I am going to clean and lube everything well and take it back out this afternoon and shoot it again before I get carried away and contact Bushmaster. misterduckduckgoose wrote: Thanks for the replies guys. I am going to clean and lube everything well and take it back out this afternoon and shoot it again before I get carried away and contact Bushmaster. Make sure it's dry before heading out. Oil in the chamber can cause the cases to not seal. It also adds to bolt thrust. A lot of people don't realize this. Honestly, I wouldn't worry a whole lot about the sooting on factory ammo. Mine did it, and it's still holding up after all the abuse I've put it through. To what Bmt85 said. I usually clean my guns at the range while they're still hot, before going home. I leave them wet with Kroil until my next range trip. Just before taking the rifle to the firing line, I dry patch the barrel a couple of patches and then hose down a 50 Cal Bore Mop with Brakeclean or some other environmentally irresponsible (strong) solvent/degreaser and stuff it up into the chamber, giving it a couple of twirls, to make sure none of the Kroil or whatever you choose to leave in the bore after cleaning, has not gotten back into it. I hose the mop off again to clean it for the next time and let it air dry while I'm shooting. That's half the equation. The other half is making sure I got the sizing lube off of the cases I used for reloading my ammo. You don't want any kind of lube on the cases for the same reason that you don't want any on the chamber walls. That's why you don't oil your magazines, despite it making them run immensely smoother. Tempting, but to be resisted. Dry lubes are just as bad but at least they don't cook off and get baked onto the chamber walls. Again, a No-No. 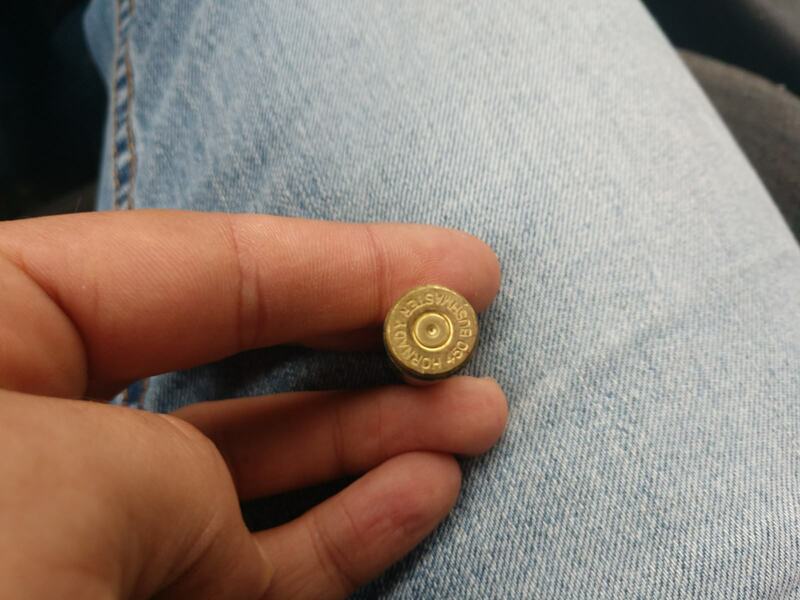 For the benefit of anybody still reading: All cartridges rely upon sticking to the chamber walls until the bullet breaks the seal at the muzzle, allowing the pressure to escape. It is fundamental to how firearms work. Without that, you'd need much stronger bolts to withstand the cases being driven back into them to a much greater degree than they already do and all your ammo would have ejector and extractor marks on every one of their heads. As Bmt85 said, "A lot of people don't realize this." Made it back out yesterday afternoon and put another 20 rounds down the pipe and this issue seems to have cleared itself up. Not sure if it was because it was brand new, because I cleaned it, or because it was a different box of the same ammo, but not matter what the reason it seems to have stopped leaving large black deposits on the cases. Thanks guys! While we love happy endings, keep in mind that issues that disappear on their own volition, tend to return on their own volition. If I had a dollar for every sooted round I ejected, I could buy a Ruger RPR, a nice scope to put on it and a reloading setup to feed it with and still have money left over!